Blue Lagoon Cruises has their own private island in the Yasawas where we spent parts of two days. Nothing not to like about an afternoon here! 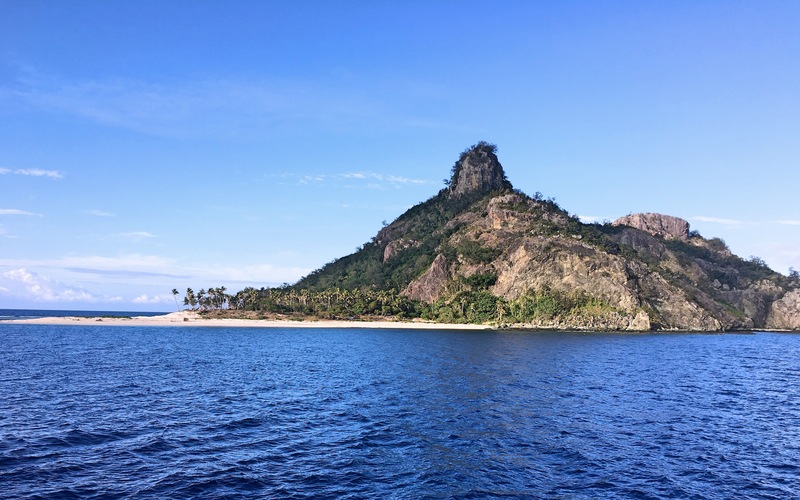 After a week in Savusavu we spent our second week in Fiji on a Blue Lagoon Cruise in the Yasawa Islands. It’s a beautiful part of the world; both Tom Hanks’ Castaway and Brooke Shields’ Blue Lagoon were filmed here. 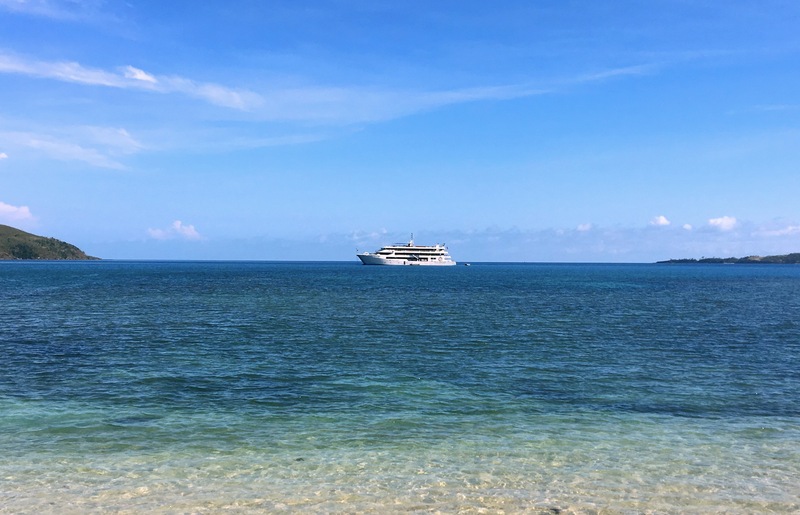 Still, we’re not typically the cruise boat types; we spent a week on a boat in the Galapagos Islands over a decade ago and a couple days on the Yangtze River more recently, but that’s really about it. (There were those 1,361 days I spent in the Navy, but that was a little different.) Still, this seemed a good way to see some pretty remote islands in Fiji. It was a pretty small boat – fewer than 70 passengers – and the TripAdvisor reviews were good. So we gave it a try. And for the most part it was good. Sailing time was reasonably limited as we would hop from island to island and, when the weather was good, there were plenty of places on the boat to either hang out and be sociable or get away to read quietly. My favorite times were cruising gently along, curled up on one of the wicker couches on the top deck with my Kindle. The breeze, the beautiful water, the passing tropical islands, and the gentle rocking of the boat were pretty fabulous. 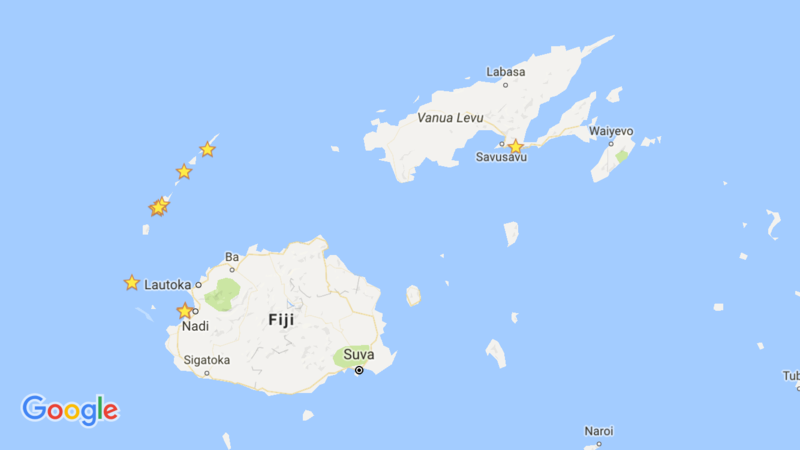 Here’s a map of Fiji. 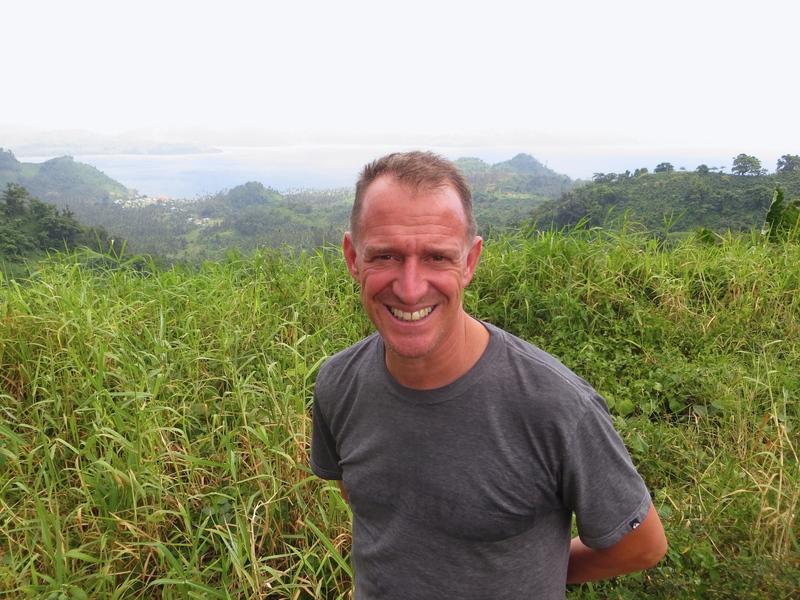 Our first stop was a week in Savusavu, marked in the upper right. 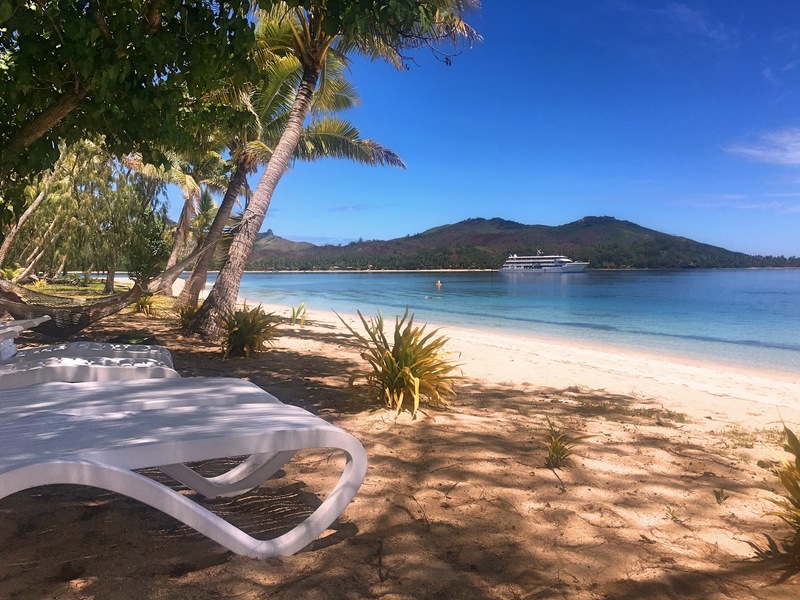 Then an overnight in Nadi on the west coast of the main island (what people often referred to as “the mainland”) and then our various anchoring spots along the Yasawa Islands. Then there were the various shore excursions. The first day might have been the best: snorkeling with sharks. That was the plan, and they delivered; there were probably half a dozen sharks swimming around our little area. We learned some years ago while scuba diving that sharks aren’t usually dangerous and these didn’t seem remotely interested in us. It’s cool, though, looking down through your mask and seeing a couple sharks circling. On other days they would put us on little boats and ferry us to typically uninhabited islands, though sometimes to islands with tiny remote villages, too. Either way, before we went ashore the staff would bring small beach chairs and umbrellas and have them set up for us. 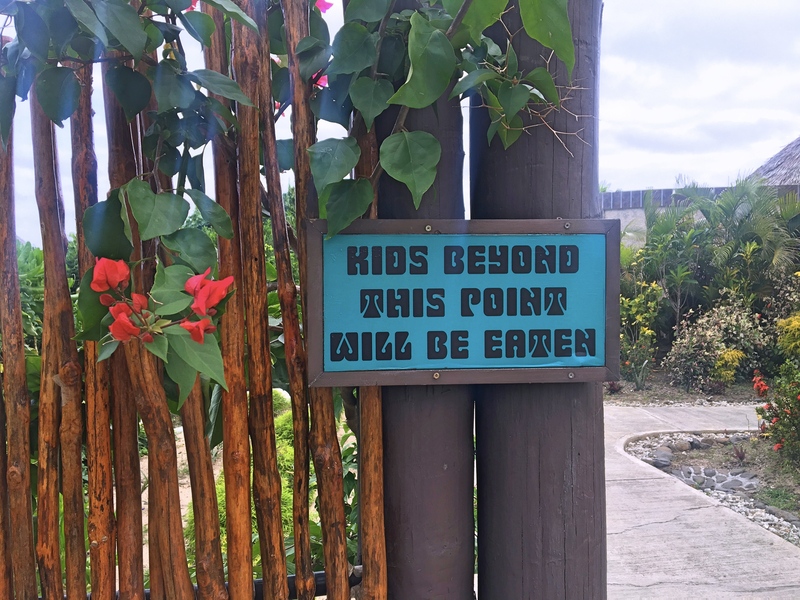 Then we could swim, snorkel, read, talk … whatever. It was very civilized. Hell, if they’d had services like that when I was in the Navy I might have stayed in! And then there was the storm. On our fourth day out most of the guests were leaving; we were doing the full seven-day cruise while some did only three nights and then were replaced by people doing the final four nights. The day started overcast and then it started raining. The group that was coming to join us came out in a fast catamaran and transferred to our boat in the rain; the group that was leaving us left in the rain. Not more than 30 minutes after that transfer was finished the weather took a pretty bad turn – heavy rain, strong winds. I can’t imagine what they would have done with the transferring passengers if it had hit just a little earlier. I couldn’t get a shot of the storm when the waves were really heavy, because it wasn’t safe to stand close to the edge. Trust me, though, it was a real storm. Now instead of being spread around the boat on various decks open to what had been tropical sunshine we were all pretty much cooped up on the one covered deck as the ship started rocking pretty hard. At one point the staff suggested we should all go to our cabins for safety but then decided we could stay out. And only later did I discover that it was our captain’s first voyage on his own! At any rate, though there were a few minutes of concern about the storm, the worst of it passed through in maybe an hour. The next day started reasonably well; overcast but not raining. We went ashore for a day on their own private island but just as lunch was being served Mark observed ominous clouds approaching. In no time at all another storm was on us. We all ran to a sheltered pavilion while the ship had to quickly cast off the lines and haul in the anchor so it wouldn’t get dashed up on shore. 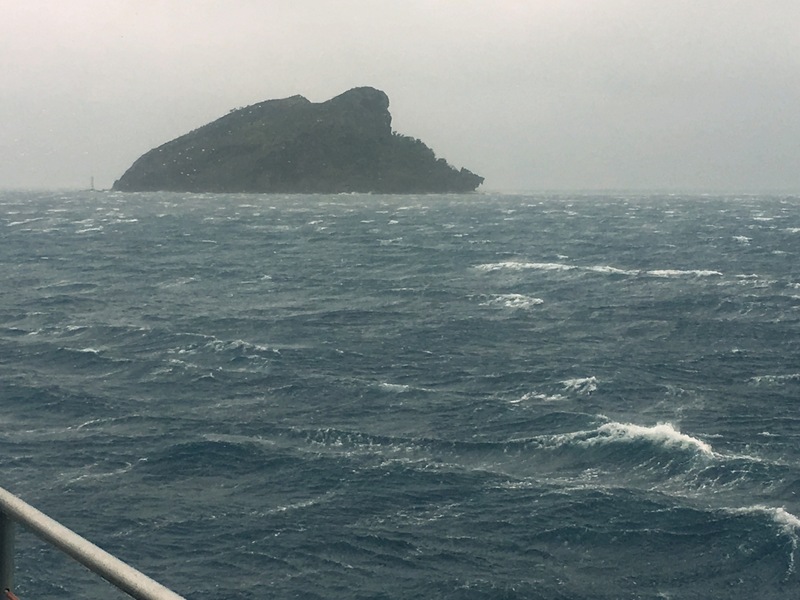 Eventually that storm passed and we were able to get back onboard. Overall we spent the better part of two days huddled under cover, sheltered from the rain but not exactly enjoying paradise. Other than that, it was a nice cruise. 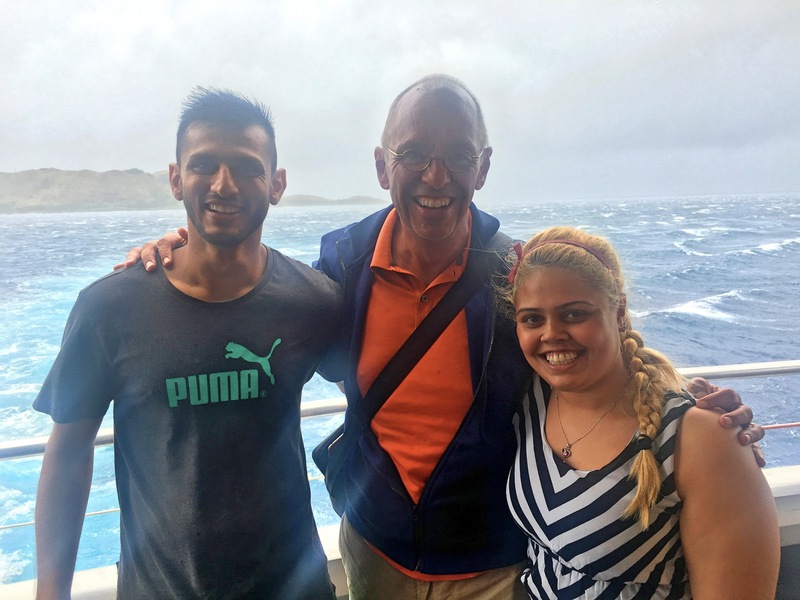 We met a bunch of fun couples – honeymooners from the DC suburbs, a mixed British/French couple traveling for nine months, a cute young Indian/Fijian/New Zealand couple who’d won the trip from her employer – which is always fun for us when we’re away from friends and family for so long. 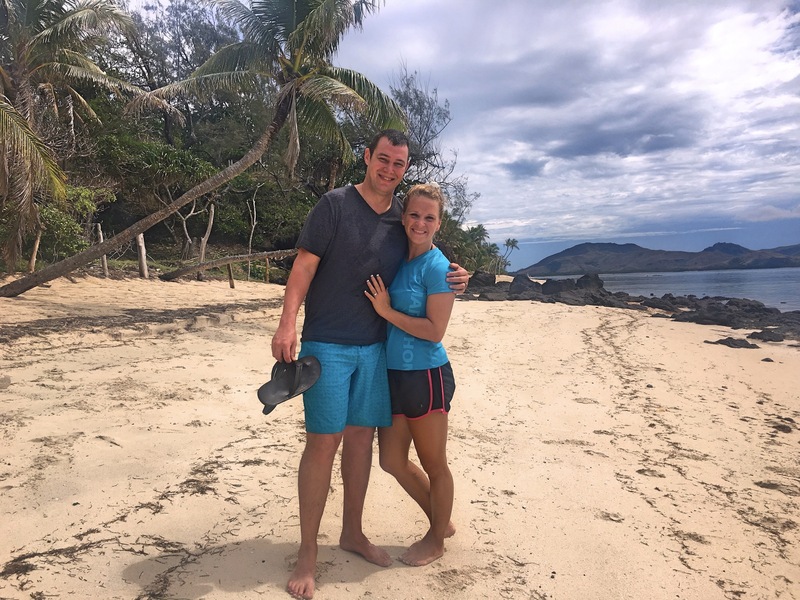 At the same time, Fiji didn’t really seem like paradise to us. As when we were in Savusavu we kept pining for Samoa. Don’t get me wrong, Fiji is beautiful and the water and islands are great. Ultimately, though, it felt too touristy, too easy, too predictable. Not high on the list of places we’re dying to go back to. 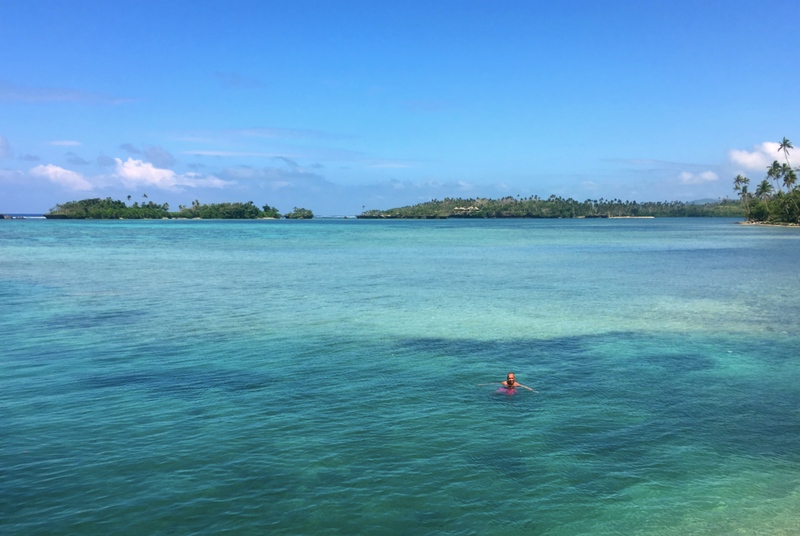 On the other hand I’m writing this in Tonga, where we flew the day after we got off the boat and this feels like the kind of South Pacific paradise I’ve always dreamed of. Stay tuned! My favorite picture from the cruise, Mandi & Mark. 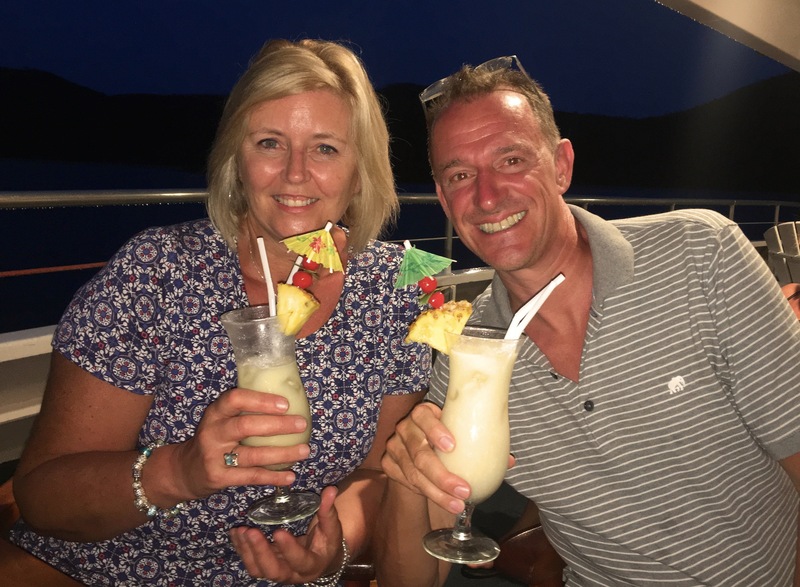 It’s worth noting that we don’t drink those kind of fruity tropical drinks, so Mark is just holding her husband’s drink. But he didn’t like it either, so Mandi was a lot of fun as the night got going! Here I am with Nazir and Sharon. She won the trip from her employer and he’s just along for the ride. Not bad! 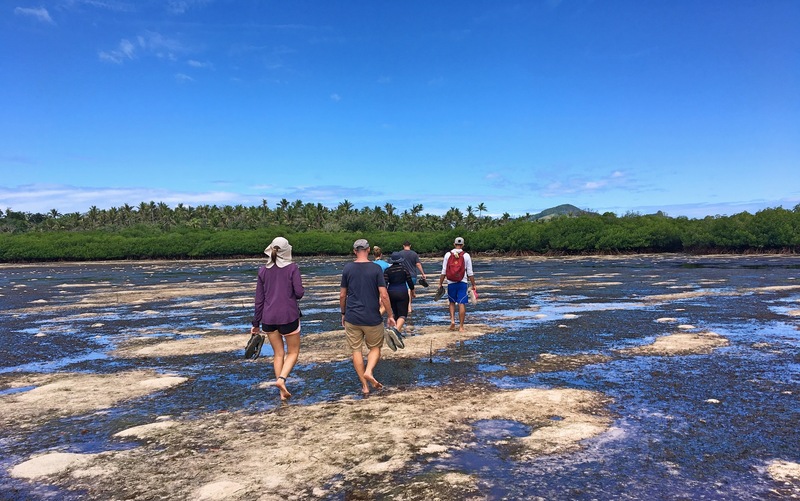 One shore excursion included a hike around an island. We were supposed to have taken a boat back but a few of us walked back instead. On the last day they offered us a tour of the bridge. 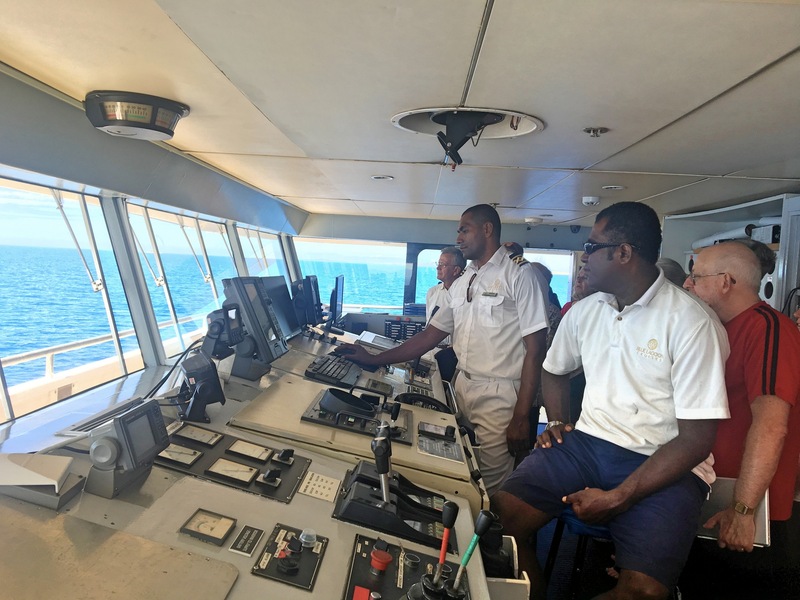 I actually spent many, many hours on the bridge when I was in the Navy but, to my surprise, the technology they use has changed in the last 40 years! We toured a tiny school one day when we went ashore. 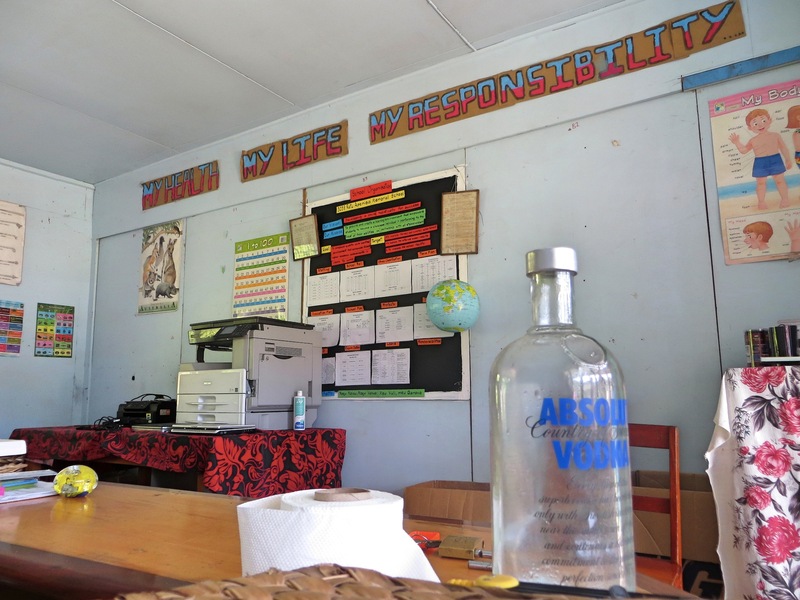 Needless to say, I loved the slogan “My Health, My Life, My Responsibility” with an empty bottle of Absolut on the table. Our daily view at the pool overlooking the ocean. Not bad when the tide is in, but when it’s out all that blue is just rocky bottom. From Samoa it was on to Fiji. 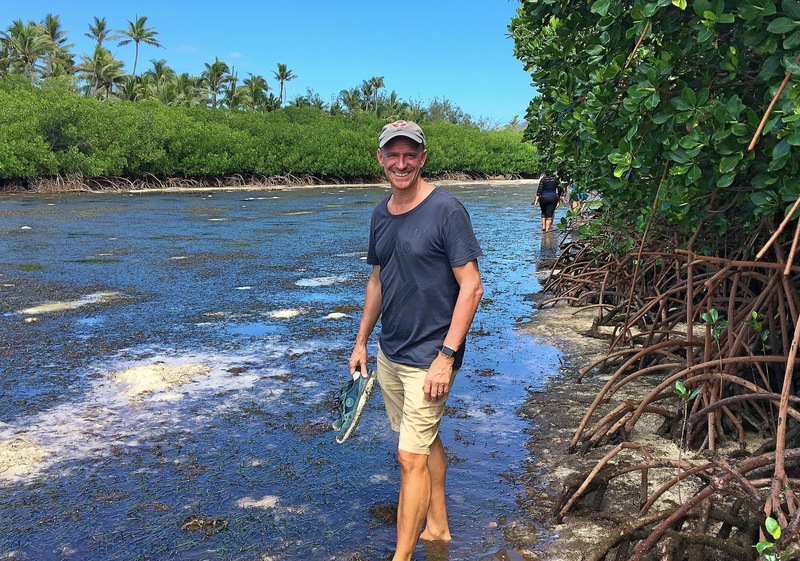 To me, Fiji and Tahiti have always seemed the very definition of paradise, so there was no question we would go to one or both. As it turns out, Tahiti is further east than we wanted to go on this South Pacific jaunt, so here we are in Fiji. There were a couple surprises on arriving here. 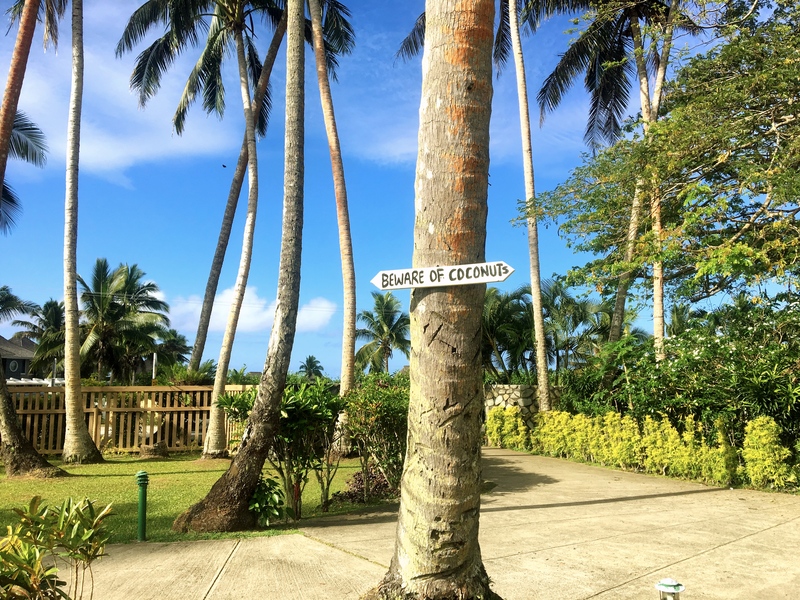 First – and we noticed this at the airport in Samoa – the people of Fiji are remarkably different from Samoans. 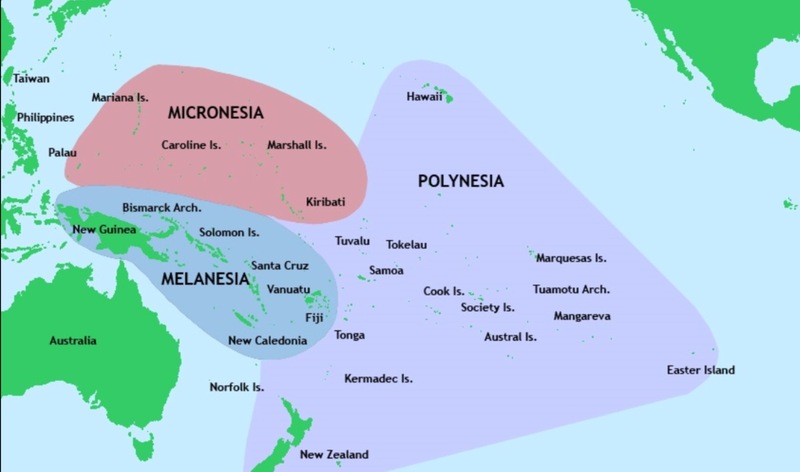 The island groups aren’t that far apart; Fiji is maybe 700 miles southwest of Samoa. It turns out, though, that Samoa is part of Polynesia, a group of of over 1,000 islands in the central and southern Pacific ranging from Hawai’i down to New Zealand and way over to Easter Island, closer to Chile than Samoa. 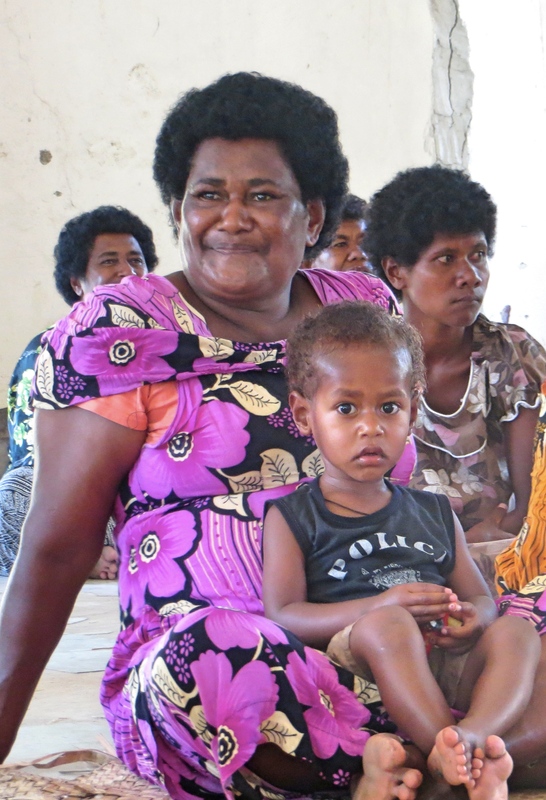 Fiji, on the other hand, is part of Melanesia, which reaches from Fiji northwest to Papua New Guinea. 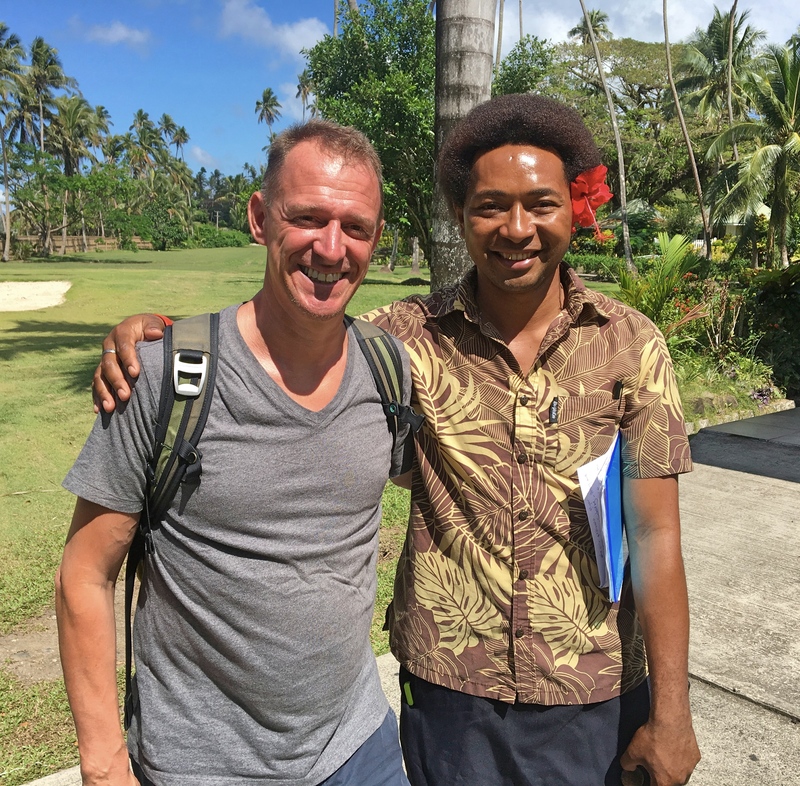 As we quickly observed Melanesians are significantly darker than Polynesians, with distinct Indian and even African characteristics. I’m sure if I did a PhD in anthropology I would have more interesting things to say about the differences, but suffice it to say that the difference was pretty striking; it’s obvious that immigration patterns in the island groups were quite different. 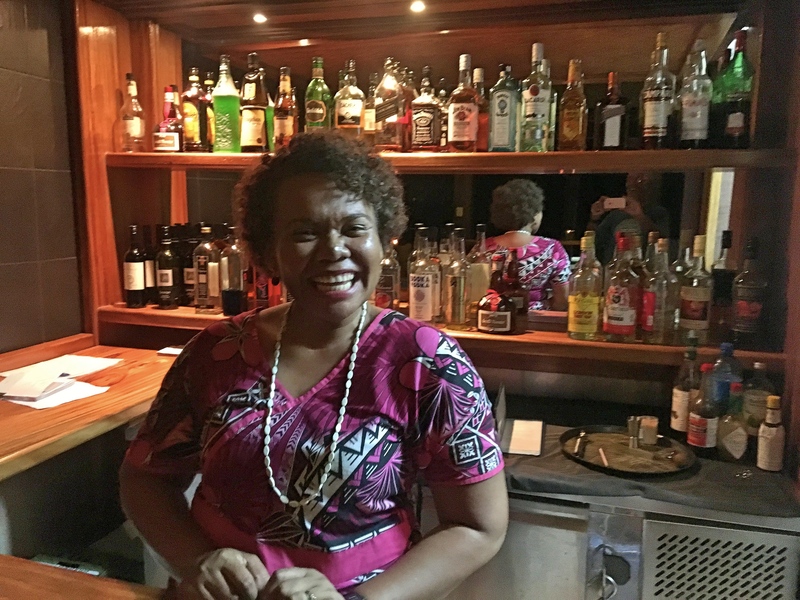 And while Fijians are certainly friendly, it’s nothing like being on Samoa. 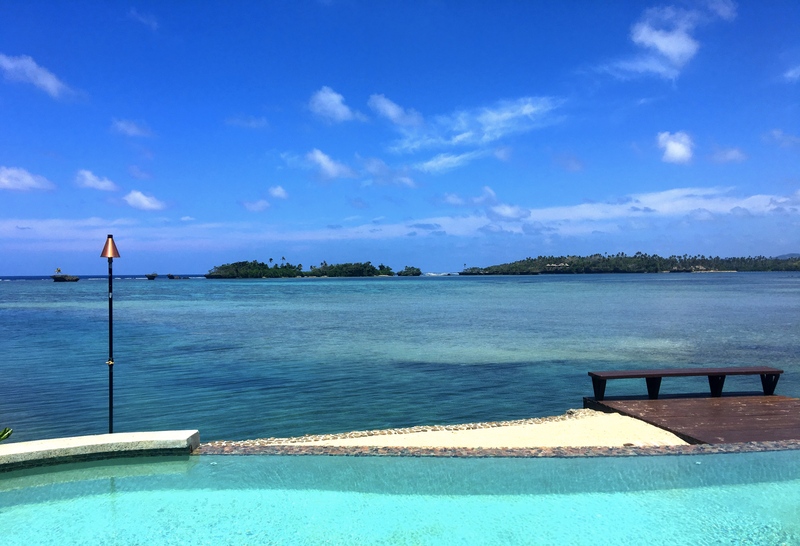 The other surprise was that – so far, at least – Fiji isn’t as pretty as Samoa was. On ‘Upolu there was just so much color in the trees and plants. The island was just gorgeous, in a way that we haven’t seen in our admittedly brief time on Fiji. On top of that the beach at Lalomanu was better than anything we’ve seen in the first week of Fiji. I never expected to be in Fiji and pine for Samoa, but there you are. 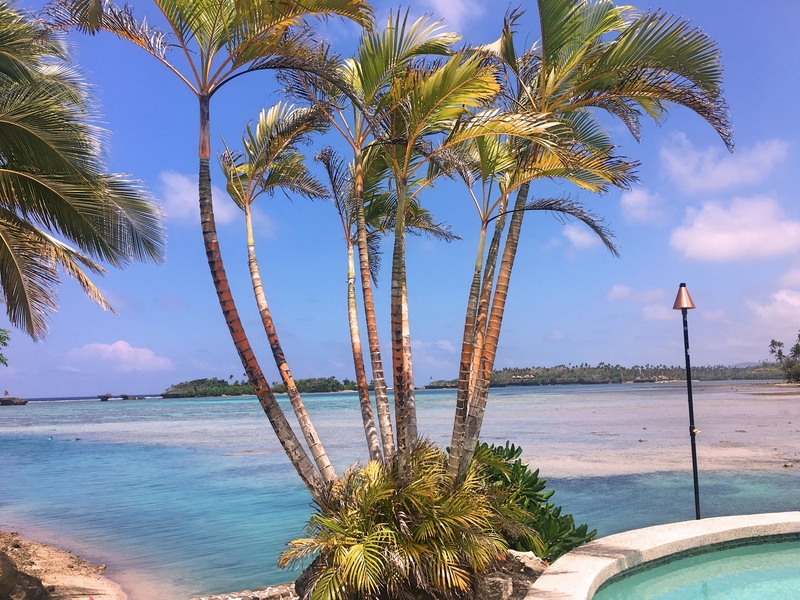 The prices in Fiji can reflect its reputation as paradise, and maybe if we’d stayed in one of those fabulous $1,200-a-night places I’d feel different about it. Don’t get me wrong: Fiji is beautiful. Maybe my expectations were just too high. 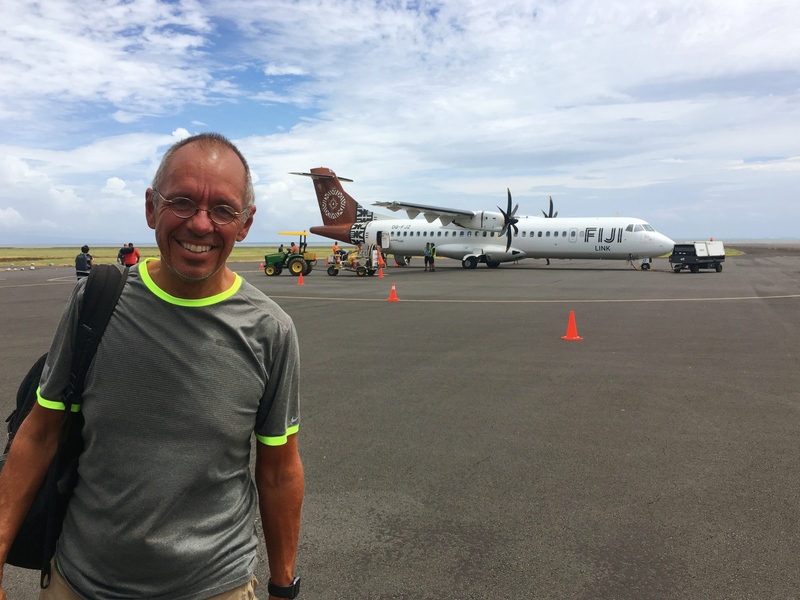 At any rate, we flew to the main island, Viti Levu and spent one night in the city of Nadi before flying on to the second biggest island, Vanua Levu. 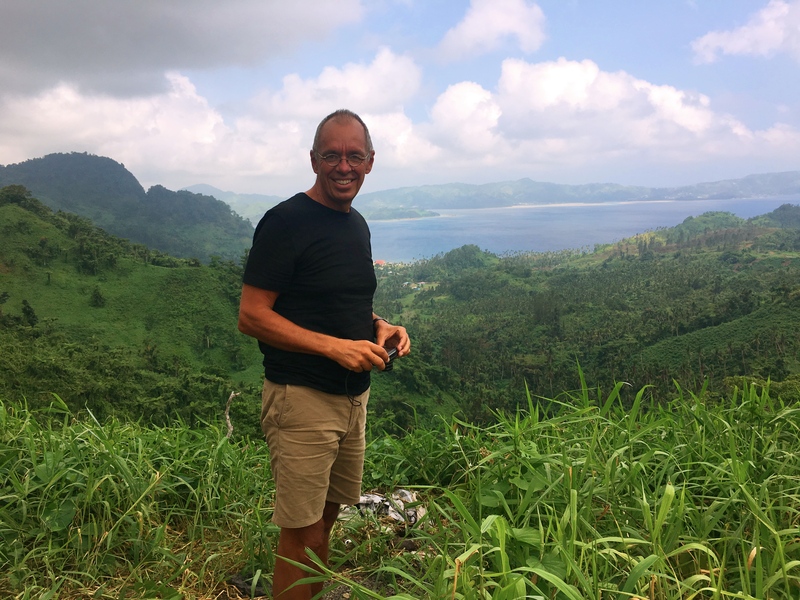 We flew into the main airport on the northwest cost of the island and were driven across the island to our (not too expensive) resort in Savusavu. While we’re not big on driving around, the drive across the island was beautiful. Then it was five days of serious relaxation. 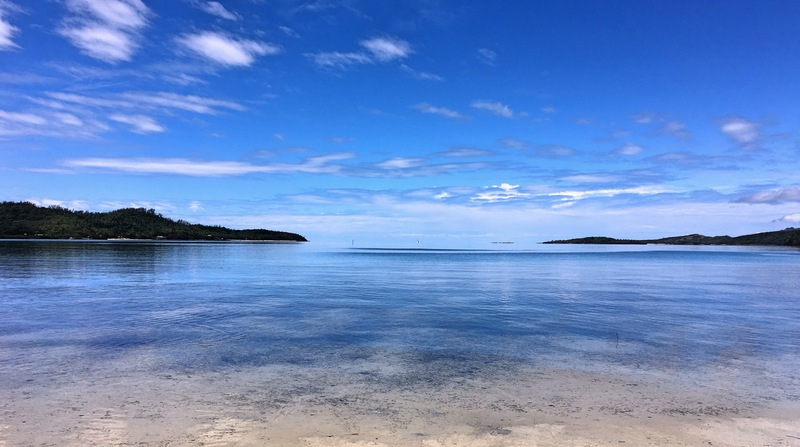 Others staying there were out doing all sorts of activities – snorkeling, scuba diving, yoga, kayaking, you name it – but we pretty much just hung out at the pool and – when the tide was in – in the ocean. The resort was big enough that one of the three pools, far distant from the others, was adult only. Very peaceful. Meals – not very good meals, I should add – were included in our package, which is just as well as we were 20 minutes or so from the nearest town. So we really didn’t have to do anything except read and rest. From here we fly back to Nadi for one night again before getting on a boat to tour the Yasawa Islands for a week. We’re skeptical that we’ll have Internet much at all for that week so it may be a bit before I report back. And, horror of horrors, we’ll be on the boat during the second presidential debate. No idea how long we’ll be without news of how that goes, but it could be torture. 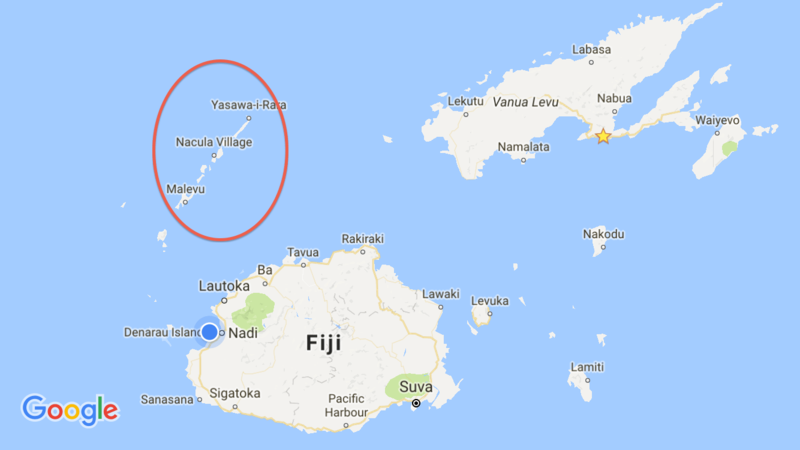 The blue dot is our location in Nadi, where we’ve got three one-night stops altogether. 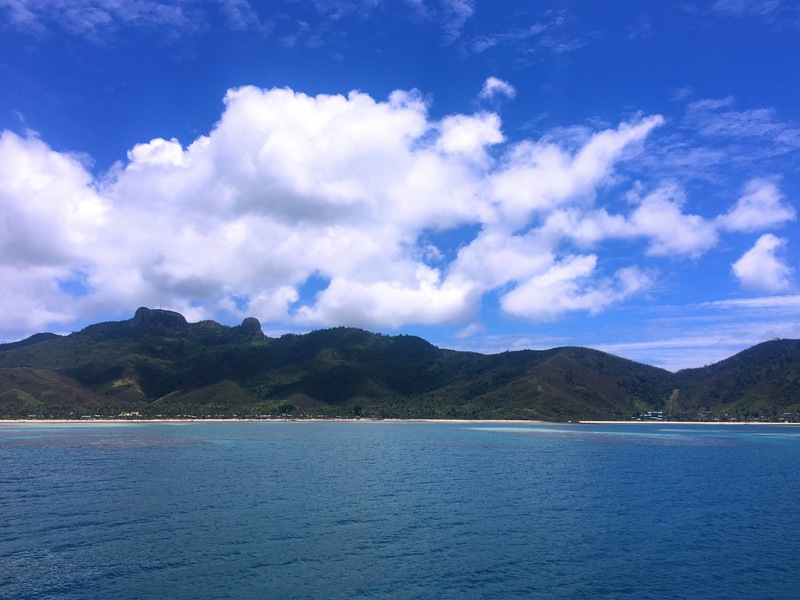 Northeast is our stay in Savusavu while I’ve circled the Yasawa Islands where we’re headed next. The pool and our little bay. Hard to imagine that I’m complaining it wasn’t *quite* paradise. That’s me out there. This pool area was a bit remote from most of the resort and was, of course, adult only. As a result we had it mostly to ourselves the whole week. Not bad. Getting ready to board the flight from Nadi to Labasa on Vanua Levu. I love little prop-jets; they make me feel like I’m really flying. This is what passes for “dangerous” in Fiji. Oh, that and the periodic coups that take place, but there haven’t been any of those in 10 years now. Did I mention that there were adult only sections of the resort?